‘Tis the season for red and white checkered tablecloths, cold drinks from the cooler, and the smoky smell of meat and vegetables on the grill. But does summer barbeque season have to happen at the expense of the environment? Fortunately, barbeques and sustainability are not mutually exclusive. Here are eight ideas that can help you host the summer feast you’ve been dreaming of in a way that keeps our planet greener. 1. Provide plates and utensils made out of recycled materials. If, like many people, you prefer to minimize the need to wash dishes after a party, there are eco-friendly options. There are plenty of products on the market now that replace the need for single-use plastic utensils and plates. For example, these utensils are made from 100% post-consumer recycled content by Preserve, a Massachusetts-based company. Tip: Do not place plastic utensils in your recycling bin. In the vast majority of cases, these products are not recyclable. 2. Serve drinks in reusable jars or glasses with a refill station. Scrap the cooler and reduce the amount of plastic and glass bottles or aluminum cans at your barbeque by providing your own, unique drinks. Make your own concoction in something like this beverage dispenser, which is made from recycled glass. If you’re up to it, go the extra mile and make your barbeque the most memorable of the summer by setting up a DIY drink station with refillable and reusable glasses. Tip: If you do serve beer or other drinks in cans, bottles, or plastic containers, be sure to place a clearly labeled recycling bin next to your trash barrel. 3. Skip the straws or use eco-friendly straws. Straws are certainly a useful tool, but you don’t have to settle for plastic. Plastic straws have an especially harsh impact on the environment. Many marine animals mistake them for food. Paper, bamboo, and stainless steel drinking straws are all great ways to avoid the environmental consequences of enjoying a cold drink. Learn more about different types of eco-friendly straws. 4. Use real linens for tablecloths. Washable linens aren’t just for weddings and fancy tent events anymore. You can find affordable linens that you’ll use for years through eco-friendly organizations. Sadly, it doesn’t matter much whether or not you choose latex or Mylar balloons – either type will harm wildlife when released into the atmosphere. Think of balloons as airborne litter. Learn more about balloons’ impact on the environment. 6. Buy locally sourced meat and vegetables. 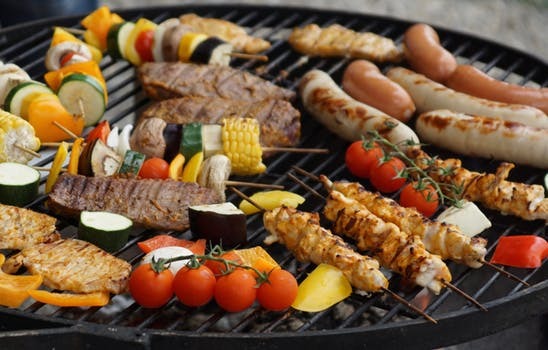 Burgers, ribs, and steaks might not be the most eco-friendly foods out there, but that doesn’t mean you can’t serve these barbeque staples in a smart way. Serving meat from local farms that treat their animals humanely isn’t just helpful to the environment – it can be a healthier, tastier option for you and your guests. Learn more about the environmental impact of different meats. 7. Provide guests with safe bug repellent and sunblock. Avoid mosquitos and the overuse of aerosols by pointing your guests to a basket of eco-friendly sunscreen and bug repellant as they arrive. Here are some great non-toxic and biodegradable sunblocks and bug repellents. 8. Keep your leftovers in reusable bags. The party might be over, but you get to relive some of the highlights all week long. Keeping leftovers is always a great way to avoid waste, and these sandwich bags make it even easier for you to pack a delicious lunch. 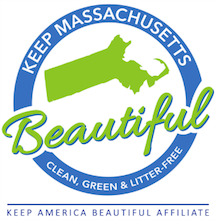 Enjoy your summer barbeque guilt-free – well, with the exception of the extra calories – by making Massachusetts a cleaner, greener place to live, work, and play!